With this guide below you will quickly learn what the Instagram hashtag is, how to use it, and how to source the best hashtags for your specific post. 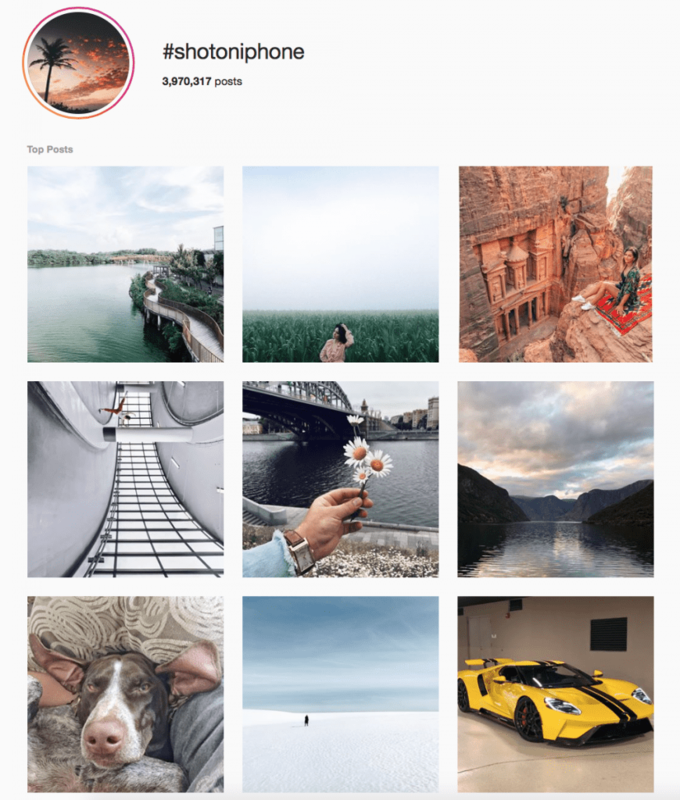 By using the best practices, combined with a little bit of experimenting, you are sure to put your Instagram posts in front of the right people. What is a hashtag, and specifically what is an Instagram hashtag? A hashtag is the group of words, numbers, letters, and even emoji’s that follow the hash symbol (#). An Instagram hashtag is the way content is categorised by the platform. As a user you can click on, or search, a specific hashtag and all the posts with that specific hashtag will appear. When searching posts will be sorted into two groups: Top and Recent. The “Top” posts are the trending, or most popular posts, and “Recent” will sort all the posts into a chronological order. You can now also follow hashtags. Hashtags are the discovery tool on Instagram. Put quite simply, the hashtag is the search engine on Instagram. Users who are looking for your content could find it through your hashtags by quickly doing a search. On average a post using at least one hashtag gains 12,6% more engagement than a post using none. If your profile is public, then by using a well thought out and planned combination of Instagram hashtags you will be able to expose your content to a much wider and targeted audience. People searching your hashtag will be able to see your content, giving you a better chance of gaining likes, followers, engagement, and ultimately more business. Post your photo or video as per usual. Add your hashtags to the bottom of your caption. You simply type # followed by the relevant text. You can easily add hashtags to older posts. By simply tapping the three dots in the top right corner and selecting EDIT. You can also add the hashtags in the comments section of your current or older posts. Special characters ($, %, etc.) and spaces are not accepted in a hashtag. Which hashtag should I use for my posts? Searches do show (most) hashtags in chronological order, so in an extremely overcrowded hashtag your post will quickly slide down the timeline, but conversely these are also some of the most searched hashtags; a real catch-22. Many of the generic hashtags on Instagram are also a key to gain spammy followers and comments; in truth you do not really want these users on your account. The question now is which hashtags should I be using to get the most out of my Instagram account? The first step to success with the hashtag is finding the hashtags most relevant to your business. You will need to do come up with a mix of some old school detective work, a methodical science experiment, and a crazy chef. Do some research into the hashtags that fit into your business. You will need to experiment with different hashtags to find which work best for you. Finally, you will need to come up with the right combination of hashtags for your posts. Where do you begin to look for hashtags that work? There are a few basic methods to start your search. Find your business niche’s influencers and have a look at what they are using to connect with others. View your competitors pages and get an idea of where to start looking. Search a few of your chosen hashtags and go through others posts to find hashtags that you think relate well to your current post too. Be creative about it. With each post you will know through your own intuition which tags will fit immediately. It could be that you took clients on a pigeon shoot then you know that tags such #wingshoot #shotgun #gundog #upland #hunting are all immediately relevant. The most important rule when it comes to hashtag use is to keep it relevant to your post. It is easy to get lost and blast your full 30 hashtag limit on a single post, but you may be attracting the wrong audience by using irrelevant hashtags, or even worse, getting hit with a Shadowban for appearing like spam to the Instagram algorithm. We also recommend mixing up your hashtags where the post allows for it, either adding or removing a few tags from your usual posts. You can use 30 hashtags. But should you? There is only one rule when determining how many hashtags you should use on Instagram; keep it relevant. We do not recommend a fixed number of hashtags. Our advice is to always use relevant hashtags, and whether you use 1 or 10 or 15 or 30, it does not matter. What you must determine is which hashtags are truly relevant and add value to your potential users, and which add nothing at all. Now that you are getting the hang of the Instagram Hashtag have you thought about how you can use the hashtag to further your advantage? We will give a few examples of companies, and products, that have taken the Instagram hashtag to the next level. What better way to get content for your marketing than getting your own users to curate it for you? Red Bull, one of the masters of marketing. You can read more about the #putacanonit campaign here. 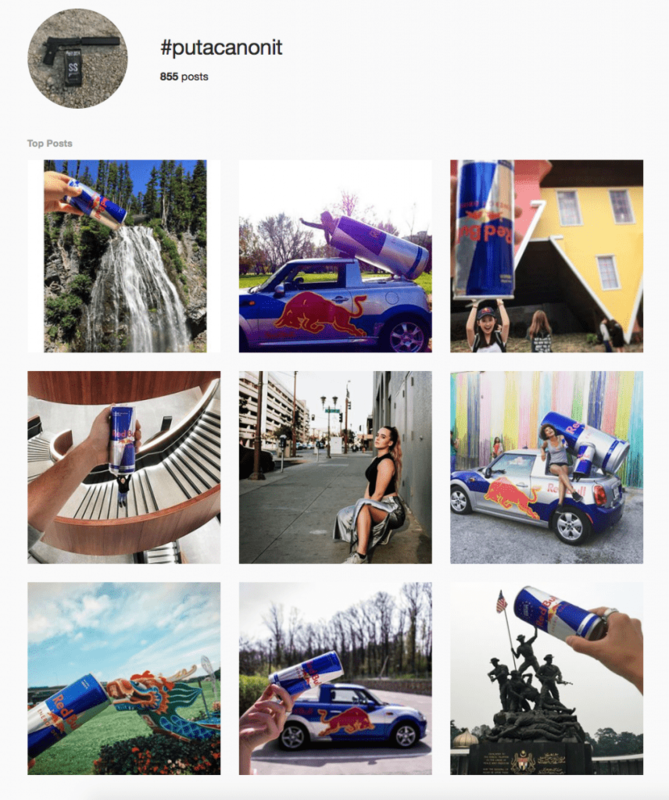 In short, a user posted a photo of one of Red Bulls iconic Mini Coopers, but held a different can over, and the #putacanonit campaign was born. The best part is that it is almost 100% user generated and organic. You would think that a company of ~130 years would be behind the times; but part of The Coca Cola Company’s major advantage has always been in their marketing campaigns, and not only have they moved with the times, they are blowing it out of the park. 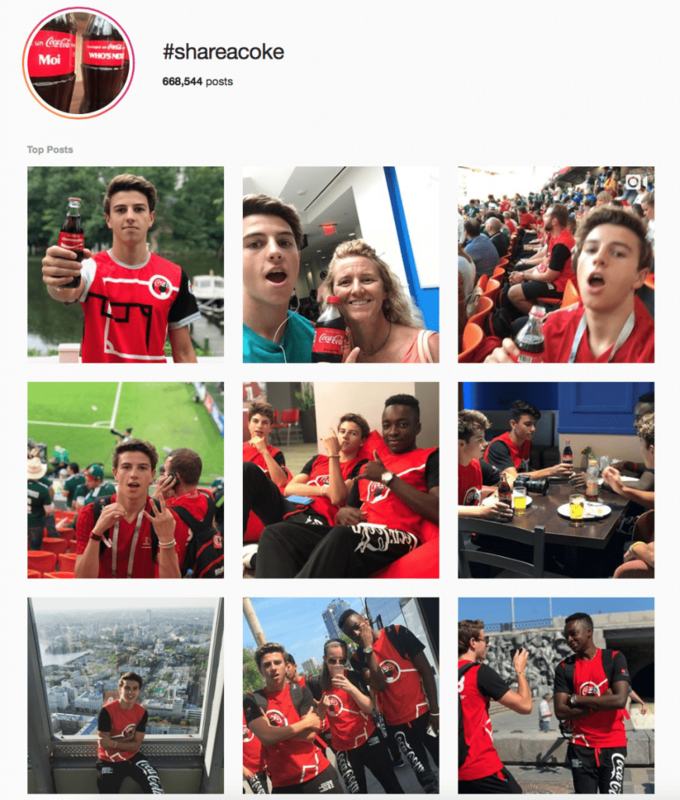 We hope that these examples give you some inspiration into how a successful branded hashtag campaign can really set you apart and give your customers and users an opportunity to share their stories too. You can now follow a specific hashtag if you wish, showing you all the posts that include that specific hashtag. This is a wonderful way to connect with those that share your tags, as well as keeping up with other hashtags that are used by your potential customers. Following a hashtag is easy. Start by searching for the hashtag you are looking for, you will then see the “Follow” button next to that hashtag. Be careful though; generic hashtags will flood your Instagram feed. Look for more niche tags. For example, rather pick #drahthaar over #dog, or #bowhuntinglife over #hunting. You want to use the tag to effectively engage with those that share your interests. Keep your hashtags relevant. We discussed this point already, but feel so strongly about it that we will mention it again. You can use all 30 hashtags, provided they are relevant to your post and brand message. Keep your branded hashtags simple and easy to spell. You want your branded Instagram hashtag to be super easy to share. The longer and more complicated it gets, the less you can count on getting your branded hashtag out there. Use popular hashtags (but sparingly). Is it relevant to your post and brand message? Then it is ok to use it; every now and then. Caption before your hashtag (or hide them completely). We always recommend keeping your caption before the hashtags, as most people do not want to read through all of your hashtags. Write your caption, and then your hashtags after. You can separate them by either leaving a few lines of single “dots” or posting your hashtags as the first comment on your post (but you won’t be able to edit it if you do this). Do not use hashtags in your main paragraph. #Reading something like this isn’t easy and won’t get you the best #engagement your #photo can get. Remember, create content for your users first. Keep it easy and simple to read and you will reap the rewards. We hope that our A-Z Instagram hashtag guide will have you motivated and feeling ready to conquer the world of Instagram marketing. Remember that the hashtag is just one of the first steps to get you up and running, but it is without a doubt one of the most important tools to help your content reach a wider audience.